(Mike) and Jeff (Zainab Lulat); grandchildren Mason Hulshof and Michael Armstrong; siblings Roger Barnes (Peggy) and Chris Gill (Dave). Barbara worked 21 years at the Argentia U.S. Naval Base. After the Base closed she turned her chatty and charming personality into a thriving B&B business that she ran for 13 years. She welcomed tourist from all over the world; turning countless strangers into lifelong friends. Barbara loved to bowl, quilt and travel the world bringing Frank along with her for the journey. A special thank you to Dr. Laing and the team of health professionals at Eastern Health for their care and compassion shown towards Barbara. The family extends their deepest appreciation for the help and support from family and friends. The family will accept visitors at Carnell’s Funeral Home, 329 Freshwater Road, on Saturday October 6 and Sunday October 7 from 2-4 and 7-9 p.m. Flowers gratefully accepted or donations in Barbara’s memory may be made to a charity of one’s choice. Frank and family. So sorry to hear of Barbara’s passing. She served as my secretary when I was Executive Officer at the Argentia Newfoundland Naval Facility from 1981 until 1984. A most competent and gracious lady, Barbara made me and my family at home as soon as we arrived. It was easy to start each day being greeted by her warm, heartfelt smile. I always made it a point to visit Barbara and Frank on trips back to Newfoundland after retiring from the Navy. I am sure the many visitors to your B&B home will remember her most fondly. GOD SPEED! I hope the memories you cherish will comfort you in this time of sorrow. Our very deepest sympathies. We are so sorry for your loss. Barb was such a delightful person. So sorry to hear of Barb’s passing. Deepest condolences. my thoughts and prayers are with you at this time. We were so sorry to hear of Barb’s passing. Her laughter and generous spirit brought much to our quilting guild. May every sweet and precious memory that you hold dear uplift you in the coming days. Frank and family, so sorry to hear of Barb passing away . Our thoughts & prayers are with you at this difficult time . May God Bless you all . My deep condolences to you all. Barb was such a lovely woman and was always so pleasant when I was fortunate enough to share a visit with her. I will always remember how she would laugh when telling the story of how I ate the icing off a birthday cake I found in the kitchen. She told every time I saw her. I had expected to see you in person today but a miscommunication changed the plans. I have been thinking of you, and of Barb. I am so sorry for your loss. We were saddened to hear of Barb’s passing. She was a good friend and we will miss our visits with her sharing patterns, recipes and listening to her stories (she had lots of them). The most important thing in Barb’s life was her family and she spoke of you often. We are in Calgary but our thoughts and prayers are with you. Treasure your memories of a wonderful wife, mother and grandmother. Frank, Janice, Donna and Jeff: Our family was truly saddened to hear of Barb’s passing. Anyone having the good fortune to meet Barb for the first time would think they had known her all their life – she was just that special. It was an absolute joy celebrating the holidays with her and Frank at Donna and Mike’s place. No one could tell a story quite like Barb, particularly her tales of life in NFLD and vacation adventures. Rest in peace Barb, you will be missed. Sorry to hear of your sister’s passing. Our thoughts and prayers are with you all at this difficult time. So sorry to hear of Barbs passing. I worked with her in Argentia and have very fond nemories of our time spent there. My deepest condolences to her family and friends. Rest peacefully Barb. We have lost another sheep from our family at St. Mark’s, Barb was full of fun and helped in many Ministries, I have fond memories of her in our ACW group. My thoughts and prayers are with you all. Frank and Family, I am so sorry to hear of Barb’s passing. My thoughts and prayers are with you all during this difficult time. God Bless. So sorry to here of Ms. Keatings passing. I still us the placemats, and pot holders she made and gave to me as a wedding present 19 years ago……that speaks to the quality of her work. She was a wonderful person and will be missed by many. Hugs to you all. Janice and family, I was very saddened to hear of the loss of your mom. Please accept my deepest condolences. Thinking of you at this difficult time. Janice: Steve and I offer our sincere condolences. She must have been a remarkable woman to have raised such a remarkable daughter. We hope your memories comfort you and your family. Frank, Janice,Donna,Jeff & Barnes family . 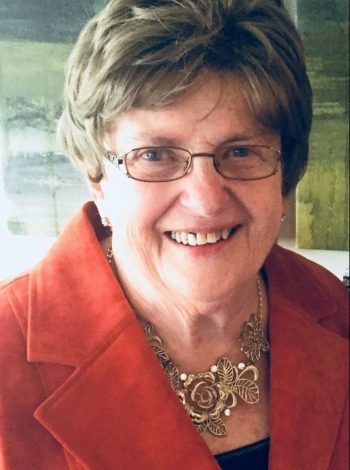 Our Sincere condolences on the passing of Barb.. . May she rest in peace..
To Frank, Donna,, Janice, Jeffrey & family: I am really saddened to hear of Barb’s passing. She was a wonderful friend to me since we were teenagers. My very deepest sympathy to you all. Barb is finally at peace. Sorry to hear of Barbs passing our deepest condolences to the Keating family..
My deepest condolences to you and your family on the passing of Barb. May she R.I.P. Frank & Family: Our sincere condolences on Barb’s passing. Cherish all your wonderful memories. R.I.P. Barb. Christine, I am sorry to hear of your sister’s passing.. To lose two sesiers in such a short span is very sad indeed.. Sorry to hear of Barb’s death it is Sad. Frank and Family, Our Deepest and Heartfelt Sympathy to you all at this very difficult time. Barb left you with many cherished memories and we pray they will help you in the days ahead. When someone we love becomes a memory, then , your memory becomes a treasure. Draw strength from each other and try to be strong . God Bless you all . Sending my love to Uncle Frank, Jeff, Donna, Janice & families during this difficult time. Aunt Barb would always arrive at any family gathering with a casserole dish, a dessert, or a homemade craft (or all of the above). I will forever cherish the homemade items she gifted me over the years – particularly the beautiful quilt she made us as a wedding gift. She loved to share stories of her children and grandchildren and was always so proud of myself and my siblings for our accomplishments. Her absence will surely be felt by all of the Keating family. I hope your beautiful memories with her bring you comfort. So sorry the hear that Barb has passed away. We’re thinking of you and your family. May God bring you peace and comfort right now and in the days ahead. To Barbs family . I was so saddened to hear that Barb had passed away. She was such a sweet person . Always with a smile and a funny story. Loved knowing her with Women’s Institute and Our Quilt Guild . For me it was always better when Barb was there. Frank, Janice, Donna and Jeff, so saddened to hear of Barb’s passing. Deepest condolences to you all. Frank, kids, grandkids, family and extended family, relatives and friends. My condolences to you on Barb’s passing. May she Rest in Peace. Frank and family: Our deepest sympathy to you at this difficult time. We remember Barb as a very caring and out going lady who loved her family. May she rest in peace. With our Deepest Sympathy on Barb’s passing. May all the memories you have shared over the years be a great comfort at this time. Condolences to all the family – thoughts and prayers are with you all during this most difficult journey! Uncle Frank, Janice, Donna and Jeffery, you are in my thoughts and prayers. Thinking of you all during this difficult time, please accept our deepest sympathy. Barb was so full energy, a great conversationalist, she enjoyed sharing her creative ideas with others. Rest in peace sweet woman. Frank and family, so sorry to hear of Barb’s passing. We spent many a good times together when she lived in Dunville. She will always be remembered. Take care of each other , may she Rest In Peace. Love and prayers. Condolences to Barb’s Family and friends. May she rest in peace. Take care of each other. Frank Janice Donna and Jeffrey. You mom was the greatest and I have always been happy to call her my friend. I have some great memories of her and always looked forward to their visits. To my BFF Barb May you Rest In Peace. You were such an absolute delight to have known for so many years. I will miss your super chatty ways, mooseballs and endless Knifty Needle creations. You were a force to be reckoned with. To Frank, Donna, Jeff & Janice, thinking of you all during this very difficult time. Love to you all. Janice, Phil and family. Sorry to hear of your mothers passing. I have enjoyed listening to the stories you have shared (in the carpool) about your family life in NFLD, as well as your parents travels, cooking and your moms quilting. A great lady. May she rest in peace. Take care of each other. Janice … we are so sorry for your loss. Mom and Dad are here visiting now. We will have a cup of tea and think of your Mom. Janice, Phil and family, our sincerest condolences. Our thoughts and prayers are with you and your family. Frank, Janice, Donna, Jeff & Families, Please accept our deepest condolences. Barb was a bright light and a ball of energy and she always had the ability to make us all smile. She was an amazing baker and I will forever cherish all my recipes I got out of Barb binder cook books, especially her cookies made with Love. Barb had an unreal zest for life and I will be forever grateful that I got to spend so much time with her in years past, a highlight will always be my trip to Dunville to Behind the Maples and enjoying my first Mug Up and learning how to fold fitted sheets and make beds properly! Barb has taught me many things over the years and I will always be forever grateful for knowing and being able to spend as much time with her has I did. I will be thinking of you all as you go through these difficult days ahead.